In my interview with author Catherine Nomura we discuss the importance of defining your skills and strengths and how important that is to your personal happiness and career development. 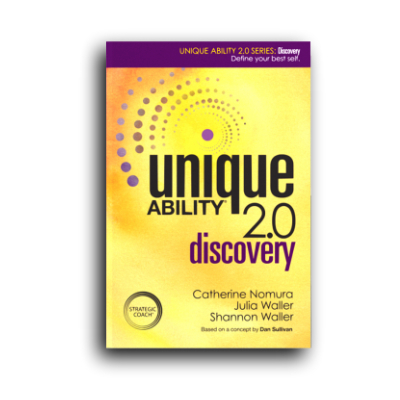 In a new book and accompanying workbook entitled “Unique Ability 2.0” Catherine with her two co-authors Julia & Shannon Waller guide the reader through a series of exercises designed to unveil your true talents and abilities. This book and workbook are brilliant in that they get you to get outside yourself and discover your true talents, passion and purpose. This team of authors has developed tools like the “activity inventory” designed to allow you to peer into things that you do daily that give you joy and fulfillment. It also informs you about the things you are doing that you don’t like doing. You will find insights about yourself that are difficult to examine unless you slow down and observe. This activity inventory exercise is designed to get you to observe your actions, and identify the ones that you love. You then move into the “activity snapshot” where you reorganize your activities into categories so you can have a clear snapshot of how you’re spending your time. This exercise give you the opportunity to see how you use your time daily, and determine how you will change the course regarding the application of your time. Where are you energized, what fulfills you and how would you spend more time doing the activities that bring joy in your life? If these are some of your questions, and you are on a quest to change how your life is both personally and professionally then I highly recommend reading “Unique Ability 2.0“. You can learn more and take a free assessment by clicking this link. I encourage you to listen to my interview with Catherine Nomura, you will be pleased that you did and probably learn more about your unique abilities.